Degas and the Little Dancer, by Laurence Anholt, is a picture book I found with my daughter at our local library when she was very young (a little past 2 and a half). At that time she was completely taken by ballet, and I wanted to find something to enrich her appreciation of art — and steer her away from Disney princesses. The promise of dance classes was what finally got us through potty training… so that’s how important dance was to her back then. So, finding this little book was amazing. The story deals with a poor girl who very much wants to be a prima ballerina, but has no means to be able to accomplish her dreams. With the help of cranky Degas, the French impressionistic painter from the turn of the 20th century, she finally can attend the ballet academy: he pays her to be his model for some of his most famous paintings and sculptures. The book is a nice organic guide through the ballet series that Degas painted, and all the original paintings and sculptures are featured at the end of the book. The story is very nice too, as it deals with the interesting relationship between the painter-sculptor and his model. Marie, the little dancer, can accomplish her dreams with Degas’ help, but the artist himself is changed by interacting with her too — it talks about the pain that sometimes lays behind art. I can’t recall exactly, but I think the book also has a list of the places where the original paintings and sculptures featured in the book are. I think that’s how we learned that there was a copy of The Little Dancer statue at the Norton-Simon Museum in Pasadena, which is very close to us. 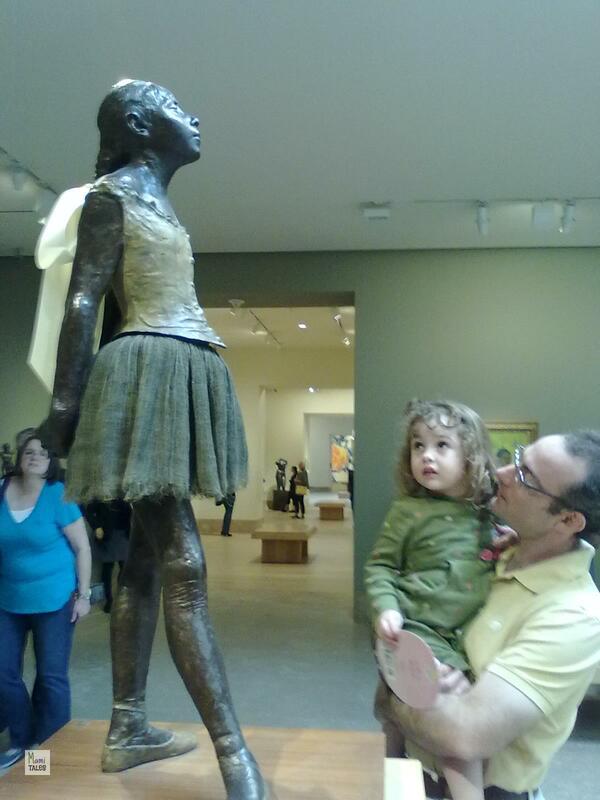 We couldn’t wait to see Little Miss I’s reaction to seeing the real sculpture, so I got it on camera. If you have a little girl, or boy, who loves dance and art, Degas and the Little Dancer is the perfect book to get them! Or if you want to introduce younger children to the great artists of the 20th Century, this book is a gem. Tagged Book reviews, Family, Inspiration for Kids. I loved the video and so did my daughter. She dances and recently decided to focus to ballet. So glad you liked it! My little one obsessively studied that particular routine at 2 and a half, and in her mind she had it down! We took video of that, but I will wait until she’s older to post 🙂 Check out the book at the library, even if your daughter is older. I’m sure she’ll enjoy it all the same, if her passion is dance! We love your books! So far we’ve only read Degas’ and Van Gogh’s. It is a very lovely way to immerse children into the world of art. I’ll look for the other 8!